Germany’s Ministry of Economic Affairs and Energy has big plans for Brazil in 2019. The new Brazilian government of Jair Messias Bolsonaro has created a lot of enthusiasm among European investors. Germany expects the partnership to flourish and has outlined a market development program to seize its opportunity. Brazil is the world’s eighth-largest economy and the overall largest economy in Latin America. It is rich in natural resources, such as rare earth elements, iron ore, precious metals, uranium, natural gas, oil and timber. The European Union is Brazil’s second-largest trading partner, accounting for 18.3 percent of its total trade. Germany is Europe’s leading economy and Brazil’s most important European trading partner. Together they are working to unite two massive trade blocs, which will cause a major realignment in world trade. But Brazil also faces major challenges, such as a security deficit, a lack of infrastructure, and other developmental difficulties. About 75 percent of Brazilians perceive the security situation as bad or very bad. Their fears are valid: Brazil has one of the highest murder rates in the world. This trend has motivated President Bolsonaro to center his policies on security and investment. Only days into office, he set course to massively strengthen and empower Brazil’s police and security forces. Considering his country’s rich and largely unexploited resources, he said he wants to trade with the “whole world.” He has especially indicated his desire to turn Brazil away from Chinese influence and back to the West. Many fear that Brazil is drifting into a military dictatorship. But Germany sees a plum opportunity to invest and exploit Brazil’s resources. With Bolsonaro at its head, Brazil’s large economy has potential to vastly increase. But to do this successfully, the new president needs trustworthy allies. 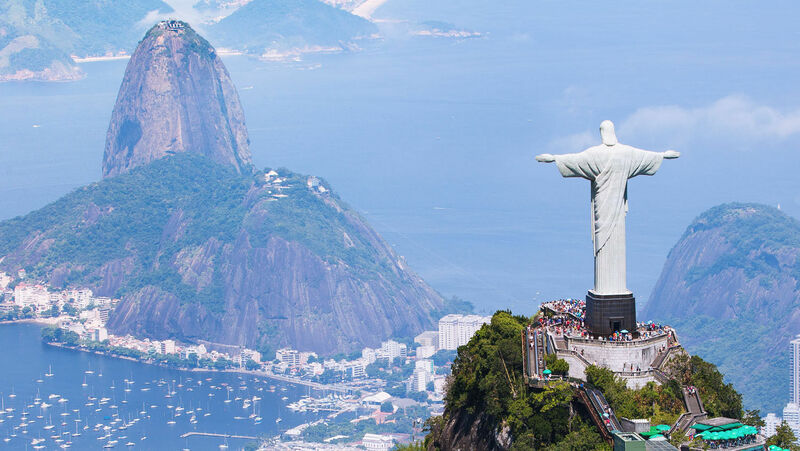 In “Civil Security Technologies and Services in Brazil,” the Economics Ministry pointed to the various positive developments Brazil’s new government will provide: better investment and trading conditions for foreign companies; reforms for market liberalization; more government spending on public safety; and an estimated economic growth of 2.5 percent this year. Brazil’s new government is a perfect fit for Germany. Germany’s and Europe’s need for natural resources can be filled by Brazil’s increased exports. And Brazil’s increased security demand is an open door for expert German security companies and investment firms to market their services. Thus Brazil is a field ready to be harvested, and Germany is preparing the threshing tools to reap the fruits. Herbert W. Armstrong pointed to two factors that would bring the European and Latin American trading blocs together: religion and language. Today, we see the emerging partnership that destines Europe to take advantage of Latin America’s resources. This coming alliance and its implications for America are prophesied in the Bible. Europe is no longer seeking a trade agreement with the U.S. but rather seeks to center the world’s trade around its own markets. This was prophesied in Isaiah 23 and Ezekiel 27. In Deuteronomy 28, the Bible outlines some of the devastating consequences this will have for America. Verse 53 is a glimpse of the terrible conditions that will result from “the siege … wherewith thine enemies shall distress thee.” This refers to an economic siege, which is being set up by Europe. Europe has a specific strategy in its trade policies. It is forging an alliance with Latin America, Africa, Russia, China, Japan and other economic power blocs for a single purpose: to bring down America. This economic siege will not be successful unless Europe draws Latin America fully into its camp. Located to its south, Latin America can be viewed as the United States’ emergency breadbasket. But these ties are about to be cut, and the Bible prophesies that the consequences will be devastating. Bible prophecy shows where today’s world events are heading. But every prophecy also culminates in great hope. Deuteronomy, Ezekiel and Isaiah all prophesy of a wonderful future beyond this economic siege. There is hope for every person caught in the coming suffering. The Bible reveals that there is great hope and protection for those who heed this warning today.